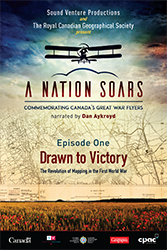 Drawn To Victory: The Revolution of Mapping in the First World War is the first in a trilogy of documentaries called A Nation Soars: Commemorating Canada’s Great War Flyers. In this first installment, narrator Dan Aykroyd tells the little-known story of how Canadian pilots and Canadian topographic surveyors contributed to the past century's greatest map renaissance. Drawn to Victory premiered on CPAC Sunday, October 30th, 2016. Wings of Courage, the second documentary in the trilogy, premiered on CPAC November 6th, 2016. Both documentaries continue to be rebroadcasted on CPAC and can also be viewed on the CPAC website www.cpac.ca by entering A Nation Soars in the site’s SEARCH ALL VIDEOS to access the titles. Flight Path of Heroes, the third documentary in the trilogy, premieres on CPAC in the fall of 2017.